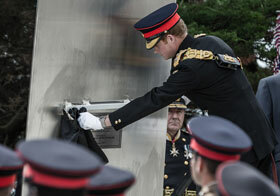 Prince Harry has unveiled a stunning war memorial, created by Lancashire-based engineering and fabrication company the WEC Group, which honours the men and women who served in the Great War. The gleaming, stainless steel arch has been made by by the company's m-tec division specialising in architectural metalwork fabrication. 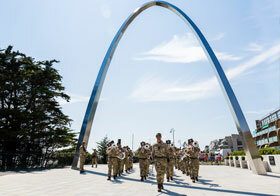 The WWI Arch was unveiled in Folkestone, Kent, by Prince Harry to mark the centenary of the outbreak of the First World War. Thousands turned out for the ceremony and to commemorate the millions of men and women who travelled to and from the Western Front during the 1914-18 conflict. The 14-metre high arch is made of highly-polished steel. 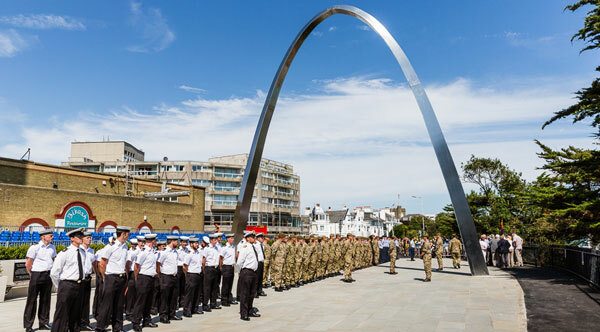 It is a catenary arch, a form in architecture recognised all around the world and sits at the top of a hill leading down to the harbour where boats awaited the troops to take them across the English Channel. It was created by the Darwen-based m-tec team for the Folkestone-based educational charity Step Short. The new memorial arch has been fabricated using 2205 duplex stainless steel and contains 100 lights to symbolise stars in the sky for the 10 million men who fought in World War One. Tom Elliot, Divisional Manager at m-tec, said: "We are honoured to have played our part in the creation of this very special memorial to the men and women who sacrificed so much for us a century ago. "The arch is a stunning piece of design work and is a fitting tribute. It now stands at the gateway where millions of British soldiers took the journey to fight for our country and is a piece of work we were proud to manufacture. "It was fantastic to see so many people of all ages turn out in the sunshine for the unveiling by Prince Harry exactly 100 years since the war broke out. "Step Short's aim is to ensure all those who passed through Folkestone during the conflict are remembered. This piece of artwork will certainly achieve that." Damian Collins, MP for Folkestone and Hythe and chairman of Step Short, attended the ceremony. He said: "This Memorial Arch stands in memory of all those who served; those who made the ultimate sacrifice and those who came home. "It makes a striking addition to the Folkestone skyline. The location of the arch is very fitting, standing overlooking the harbour where the ships waited to take millions of soldiers to France during the course of the war. "It also marks the route taken by so many of the men, many of whom would not return, marching down the Road of Remembrance, to board those ships. "I would like to thank the organisations that have been involved in building the arch, in particular the WEC Group from Darwen in Lancashire, who constructed the steel arch." The arch remembers nurses and civilians as well as all the soldiers from many nations, many of whom would have heard the order "Step Short" as they prepared to descend the steeply-sloping Road of Remembrance in the port, then known as Slope Road. 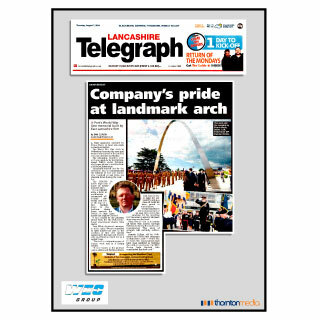 Fabrication work for the arch was carried out earlier this year at m-tec's Darwen factory and it was delivered ahead of schedule to international property company Land Lease, which carried out the construction work. The £500,000 project was designed by architectural design company Forster Gearing. M-tec is one of Darwen-based WEC Group's 12 divisions and it creates striking pieces of art which can be seen in towns and cities across the globe. Other projects carried out by the m-tec team include the distinctive Airbust sculptures which can now been seen at various BAE Systems operations across the UK and the Darwen Spitfire Memorial in WEC Group's home town. It has recently delivered its first African order, an impressive stainless steel globe that now stands on a prominent roundabout in the Nigerian city of Uyo, which is in south-eastern Nigeria and is the capital of Akwa Ibom, a major oil-producing state. The WEC Group is one of the largest engineering and fabrication companies in the UK with a turnover of more than £35 million. Its manufacturing capability ranges from footbridges and bus frames, to log-fired stoves and street furniture across 12 divisions and with operations in its home town of Darwen as well as Blackburn, Knowsley on Merseyside and Leeds.